I stayed about a 45-minute walk up from Marinella beach. As you should know if you're considering staying in Positano, walking is pretty much the only mode of transport, and those 45 minutes are spent almost exclusively ascending up little concrete stairwells. I generally ate one meal out each day, and made the rest of my meals at home, so I've included my favourite grocery store in case you're looking to stretch your Euros too. I'm a hungry girl, so my first stop-off was about 5 steps away from my deckchair at Marinella beach. Looking like a cheerful and quick lunch spot, I scanned the menu and saw a couple of possibilities. I asked the hilariously moody waiter if the mixed vegetable plate was a big portion and if it was enough for a main meal (he confirmed "si si", but as you can see from the picture on the left, this was false-false). I returned unbeaten the following day and ordered seasonal fruit, grilled aubergine & courgette and a mixed salad which, happily, was enough for a main. The fruit & salad were good; the vegetables were tasty but super oily. Spoiler: super-oily was a theme in Positano. Tip: ask for your bill when your meal arrives. I went to La Marinella a total of 3 times due to its close proximity to the beach, but waited a reeeal amount of time for any acknowledgement or service on each visit. One time I sat for half an hour waiting for the bill whilst one waiter went for a cigarette and the other took a ten-minute break to enjoy the view. It's a different pace of life and you just have to embrace it! Lo Guarracino was recommended to me by a Swiss couple onboard a boat to Capri, and it was stunning. We sat in a quiet woody corner surrounded by green, and the waiter went through all the vegan options on the menu. I went for grilled pumpkin, mixed salad & garlic spinach and picked at my co-diner's cherry tomato salad - again, the pumpkin was very oily, but a puddle of oil comes as standard. The spinach was perfect. When I arrived at my Airbnb, my host Nello recommended Il Fornillo as it's his favourite pizza place in town, and I spotted it on a walk on the way back to my apartment one evening. I just wasn't craving pizza after a long beach day, so I got a bean soup with spinach & lemon (to take away as I needed a post-sea shower as badly as I needed my food). The staff were lovely - offering all sorts of adaptations to their normal dishes, and I meant to head back to try their squash blossoms but never got round to it. The bean soup was a bit poor for €6 - basically baked beans with a couple of herbs - but the spinach was great. The pizzas seem better value for money (they can be made vegan and are served after 6pm), so if you're up for it I would give Il Fornillo a shot! Caffè Pupetto is near the very bottom of the final staircase heading down to the beach, and as I passed it every day I decided to venture in and see if they had more than my go-to plate of aubergines to offer. Luckily I love a good aubergine. I had mixed grilled vegetables (aubergine, courgette, squash) and spinach & lemon. The vegetables were, as usual, drenched in oil, and by this point I’d developed a technique with napkins where I’d soak up all the oil before tucking in. This oil, to be fair, was basil-infused and added a really nice flavour to the meal. The service at Caffè Pupetto was good, and again there was a lovely sea view to enjoy whilst dining. Walking up along the slower, sloped route back to my apartment one afternoon (still with plenty of stairs), I came across a little place offering two sorbets: lemon and strawberry. The server informed me that the strawberry one was dairy-free and the lemon contained ‘just a little milk’. I got the strawberry. It was very rich and fruity and tasted like actual strawberries, not just sugar & water like many I've sampled in the past. +1 for this place! Tip: Across all eateries - restaurants and gelateria - it might be wise to tell the staff you're allergic to dairy so that they take you seriously. 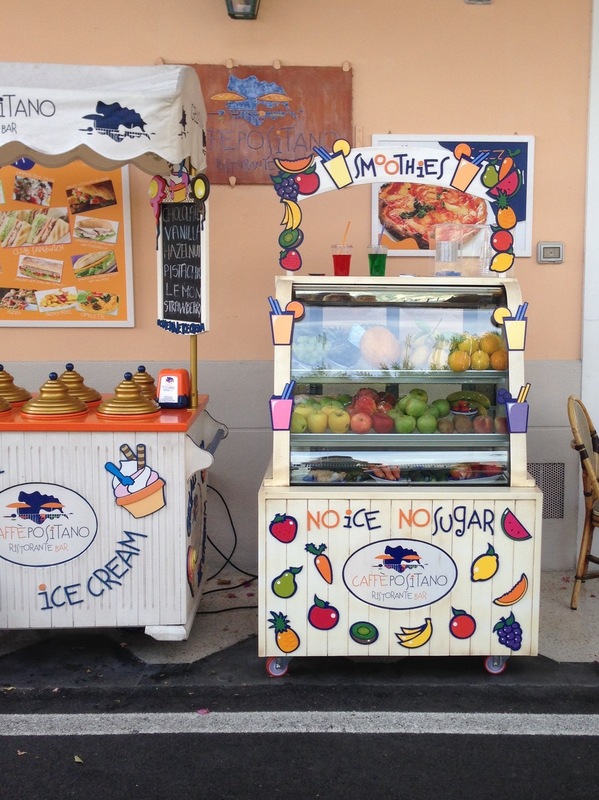 There’s a smoothie stand that states “No sugar” along the winding road (there’s really only one main road in Positano. I’ve included the address below). I love a good clean juice, and the waiter said I could choose my fruit & veg and that smoothies were €4 a piece. I returned the next day and asked for carrot, cucumber, green apple and ginger. The waiter took one carrot the size of my index finger, a cucumber 5 inches long, half an apple and a slice of ginger and stuck them all in a blender with nothing else added. He looked bewildered at his creation as he tried to pour the thick goop out of the jug, and charged me €5. As the ingredients had been picked straight from the display case that had been in the sun all day, the smoothie was a warm, semi-solid mud pie. I think poor food/drink can really be redeemed with good service, but when the service is so cold that you’re scared to ask why you’ve been overcharged, I’d just outright not recommend heading there! 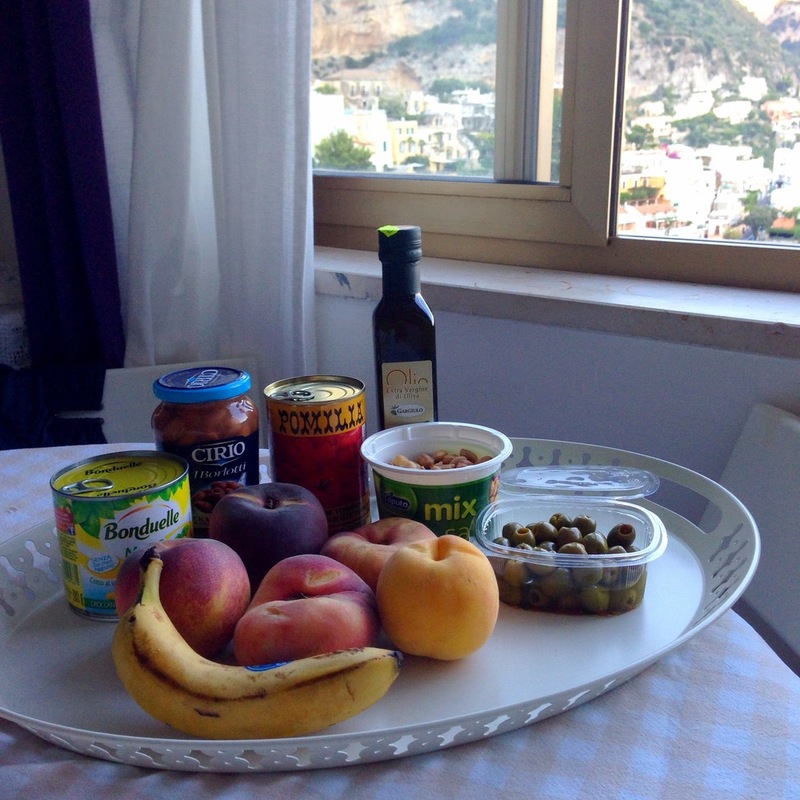 If you go down the route I did and decide to home-make your meals, rest assured that it is doable even though there are no proper supermarkets in Positano. There are a few (although really not many) mini-mini-markets dotted about, with lots of local fruit and vegetables to sell. The fruit needs searching through as a lot of it is spoiling and/or covered in fruit flies. By far my favourite place has to be Latteria - ironically “The Wine & Cheese Shop”. The people are so friendly and they have a great selection of the freshest fruit I saw in Positano. They also sell a range of plant-based milks, big tubs of salted cashews (my Kryptonite) and cheap tinned beans & chopped tomatoes. They’re a little bit up the slope from the town centre, but it’s worth it just to get away from the central prices and for the warmth of the staff there. I’m very focused on nutrient-dense foods, so a lot of refined-carb-based vegan options, such as bruschetta and pizza, weren’t appealing to me when dining out. If cooking at home, on top of any breads, pastas & cereals, I would recommend stocking up on nutrient-dense staples: fruit, veg, all sorts of beans, tinned tomatoes and - if you get bored of all the delicious fruit - nuts to snack on throughout the day when there aren't many vegan options around town. If you're lucky you'll find ripe figs to pull from the trees along your walk :). It was 30°C+ every day I was there in early September, and fruit was falling everywhere. Although Positano isn’t overtly vegan-friendly, it’s definitely navigable with some local knowledge. Just remember to (1) pack some seeds in your suitcase to turn any salad into a meal, and (2) make sure you slow down and enjoy the pace of this idyllic little town, with its abundance of character matched only by that of its hospitality workers. I hope you soak up as much sun as you will olive oil!